Home → News → Bez kategorii @en → 9th Conrad Festival is behind us! 9th Conrad Festival is behind us! 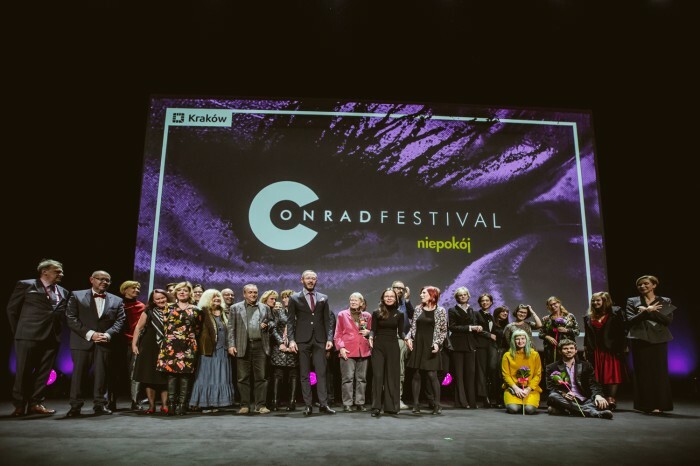 – said Grzegorz Jankowicz, Festival Programme Director at the Conrad Award Gala that concluded the 9th Conrad Festival continuing from Monday. The winner of the award for the best debut of the year is Anna Cieplak, the author of the book Ma być czysto, a story about the life of junior secondary school students. “It is a funny coincidence. The motto of this year’s Festival edition is “Unrest”. Exactly a year ago I was working with young people on a project bearing the same title” – said the author accepting the award. “Today there are even more causes of unrest than 12 months ago. This is why, though I am happy with the award, joy mixes with uncertainty.” The award-winning author received PLN 30,000, a statuette and an offer of residency programme in Krakow. Magdalena Sipowicz and Renata Szpilka received awards for the best translators, and Anna Goc for the best moderator. After the award ceremony, Siri Hustvedt gave a master lecture, in which she talked about her writing method and about the relation between the work and the reader. ”As you open the book, its characters take you into their power” – she said. Before Festival guests, organisers and audience met at the Gala in the ICE Kraków Congress Centre, discussions continued all day long in the Czeczotka Mansion. Writers Wioletta Grzegorzewska and Weronika Gogola discussed if one can be proud of coming from a small town. Both of them are critical about provinciality in their books, but they can also show what is valuable in small localities: brave resilience, caring for community links and charming spirituality. – I wrote Guguły, to answer the question: “In what do the two worlds differ?” – said Grzegorzewska. – “The borders between them are becoming more and more unclear nowadays. Perhaps they will disappear altogether soon”. An important part of the programme of this year’s festival were meetings with biographers, e.g. : Magdalena Grzebałkowska, Marcin Borchardt, Remigiusz Ryziński, Krzysztof Tomasik and Wojciech Orliński. On the last day of the event, time came to answer the question: Why do we actually write and read biographies? This question was discussed by Klementyna Suchanow – the author of the recently published, two-volume book Gombrowicz. Ja, geniusz and Monika Piątkowska – the author of the book Prus. Śledztwo biograficzne. ”Biographies are for grown-ups something like fairy tales for children” – said Suchanow. “We read them to learn who our authorities are and where we come from”. Though they took up extremely different tasks – Gombrowicz left a lot of biographical material, whilst Prus for all his life guarded his privacy, did not run a diary, did not collect notes – both biographers understand their work in a similar way. “Language skills are very important, it is good if the author has them. But the most important thing is to reach the facts” – said Piątkowska. ”Without them we can write fairy tales or blogs” – added Suchanow. As every year, one discussion was dedicated to Joseph Conrad. This time it wasn’t the discussion about translations and interpretations of individual works, but about why we can dislike the patron of the Festival. It turns out there are a lot of reasons – his contemporary fellow writers considered him a traitor, because he did not write in Poland or in Polish, whilst later generations often accused him of racism and colonialism. “Conrad could not write in Polish; the contact with the Eglish language awakened the writer in him” – said philosopher Agata Bielik–Robson. – He was interested in universal issues rather than the local ones, trying to find an answer to the questions: What happens when the mind tries to become rooted in the foreign land , the issue dealt with in The Heart of Darkness. “In Poland no one would forgive him that he deals with something else than Poland” – added the writer and literary scholar, Ryszard Koziołek. Panellists also discussed Conrad’s controversial approach to British imperialism. Why didn’t he ever clearly condemn the Empire’s colonial activity? Why did he write about Africans in such a way that he was later accused of racism? – Conrad takes up the issue of a modernisation project but he does not judge it, said Bielik-Robson. — All of his characters eventually surrender, they seem to say: I don’t understand this world and never will. The series of discussions was closed by a meeting with Jean–Ulrick Désert, an artist participating in the exhibition “A New Region of the World” on display in Bunkier Sztuki Gallery, in line with the programme of the Conrad Festival. In his works he analyses the problem of otherness and seeks alternatives to colonial mechanisms. On the last day of the festival you could also talk with Joanna Karpowicz and Magdalena Lankosz, the authors of the comic strip Anastazja.